After being buried deep beneath piles and piles of schoolwork, the last week of our Daily Sketches has surfaced! It’s been awhile since we’ve been at it, but we decided that it was only right to finish what we started. So we dusted off those sketchbooks once more to give you the final 7 sketches of our Daily Summer Sketch Experiment. 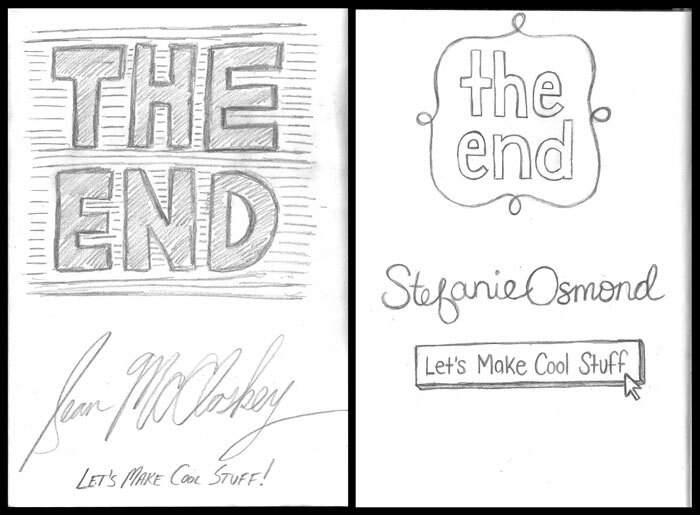 Without further ado, we give you The Lost Sketches. Day 92: A trip to New York City inspired both sketches this day. 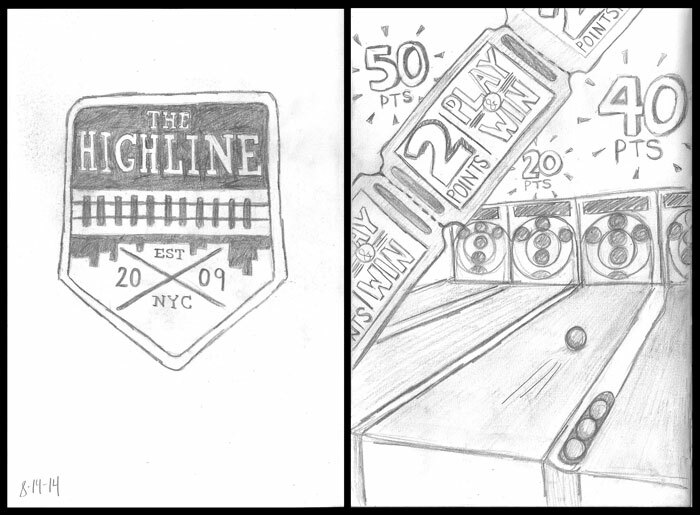 Sean creates a cool new logo for the Highline, while Stef captures the fun and excitement of a trip to Dave & Busters. 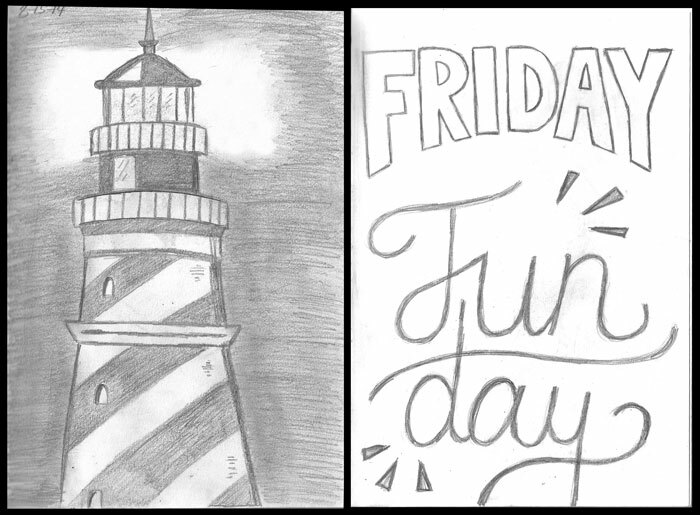 Day 93: Stef lacks inspiration for today’s sketch, so a simple typographic sketch shows that Fridays are the best days. Sean, on the other hand, finds inspiration in the distance with the light from an awesome striped lighthouse. Day 94: Summer comes close to an end, so a campout in the backyard inspires both sketches this night. 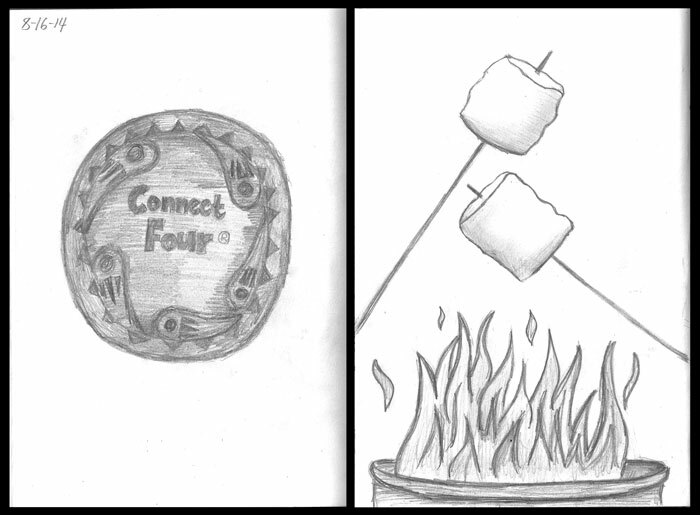 Stef starts the night with a sketch of her favorite summertime activity, roasting marshmallows! Then, a board game battle breaks out in the tent, so it is only fitting that Sean sketch the winning chip from Connect Four. Day 95: Wowwee! Two days in a row, Stef wins a raffle at both a picnic and a baseball game. 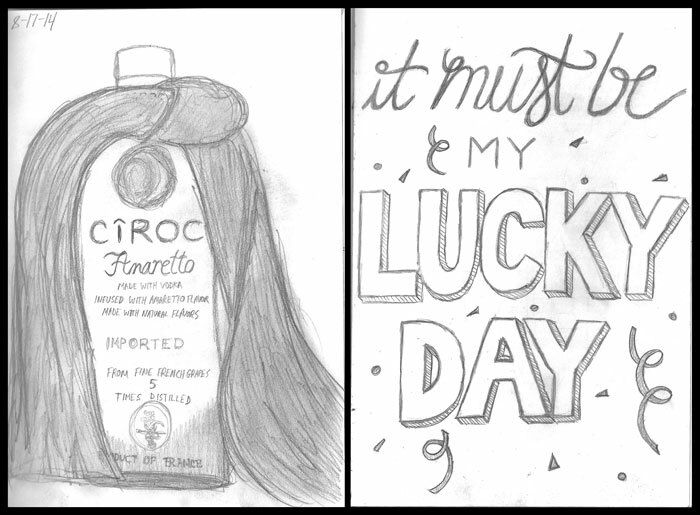 She celebrates her luck with a celebratory typographic sketch. Sean, on the other hand, decides to sketch a combo of the prize items that were won. (3 bottles of vodka, and a gift basket of scarves) Hooray for raffles! 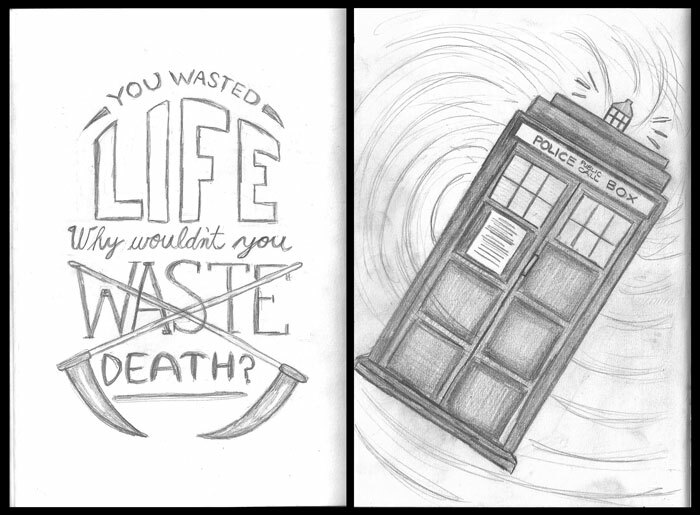 Day 96: Sean does a lyric from yet another Modest Mouse song, while Stef goes time traveling with The Doctor in the Tardis. 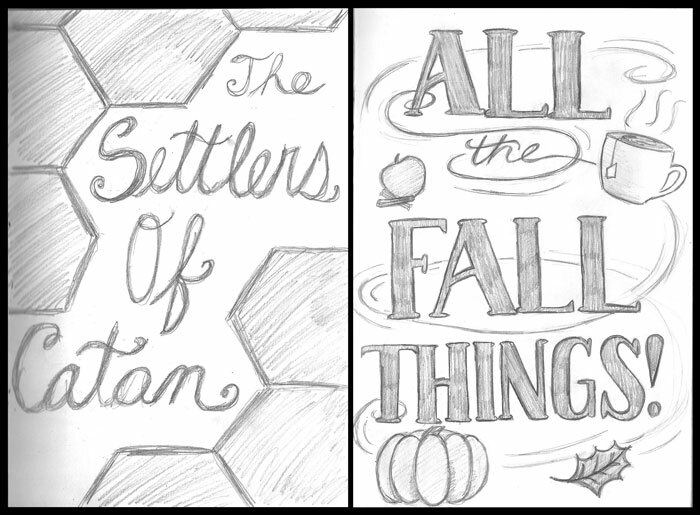 Day 97: A night of playing Settlers of Catan inspires Sean’s hexagonal-based sketch, while Stef embraces Autumn and declares her love for all things Fall. Day 98: ***Theme: THE END! *** We finally made it! A whole summer of sketching! Nothing left to do but sign our names and call it a job well done. I hope everyone’s enjoyed our summer sketches and all the craziness that has gone into these posts. I think we’re both happy to finally get this last post up and officially bring this project to a close (especially considering we’re posting this in mid-October). I think we have a lot of great work to look back on and use for future projects. We’re looking forward to finishing up school and having more time to post on the blog, so check in occasionally for some random bursts of awesomeness. Also, check out this cool video Sean made for one his classes that contains ALL of this sketches put together!